Arsenal goalkeeper Bernd Leno produced a stunning double save to preserve the Gunners’ lead vs north London rivals Tottenham going into halftime. In the 43rd minute of the clash, there was a change for Tottenham as Harry Kane became the provider for Christian Eriksen, the England captain played an inch-perfect lofted pass into the box and Eriksen fired at goal from close range. 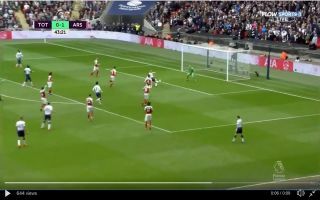 The Gunner’s lapse in concentration was bailed out by a block from Leno, the Germany international was called into action immediately after to stop Moussa Sissoko’s rebound from hitting the back of the net. Leno may well have produced the best set of saves of the season.